Founded in 2005, the A3C Festival & Conference (Oct 3-7, 2018) has grown from a local showcase to become one of the most important hip-hop events of the year. The A3C Festival features 3 stages with dozens of performances. It’s a breeding ground for the next generation of stars while honoring the legends and trailblazers of hip-hop. 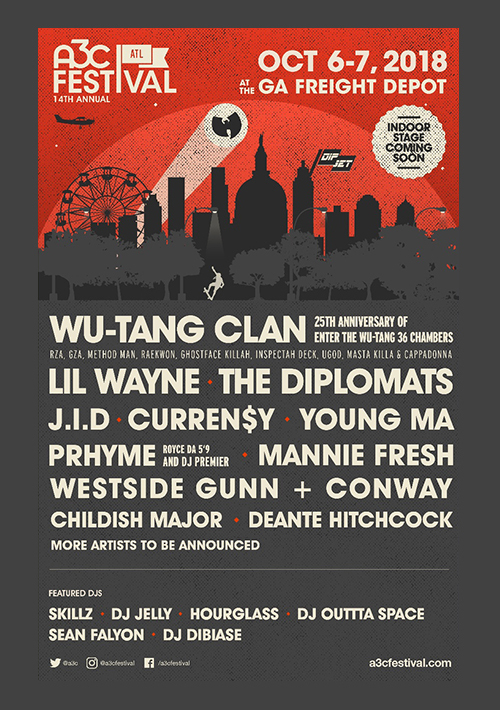 The A3C Festival outdoor stage features performance by Wu-Tang Clan, Lil Wayne, The Diplomats, Curren$y, Young MA, PRhyme, J.I.D, Mannie Fresh, Westside Gunn + Conway, Childish Major, Jarren Benton & Kato on the Track, Deante Hitchcock and Stevie Stone & JL. Saturday, Oct 6th features a few of A3C’s favorite up-and-coming spitters from across the US: Lute (South – North Carolina), Lou The Human (East – New York), IshDarr (Midwest – Wisconsin) and Caleborate (West – California). Sunday, Oct 7th highlights talented women. Trina headlines a lineup featuring some of the most talented women hip-hop artists on the rise: Saweetie, Lightskin Keisha, Yung Baby Tate, Killumantii, Brax and Cherele.